Which cruise lines are the biggest polluters? 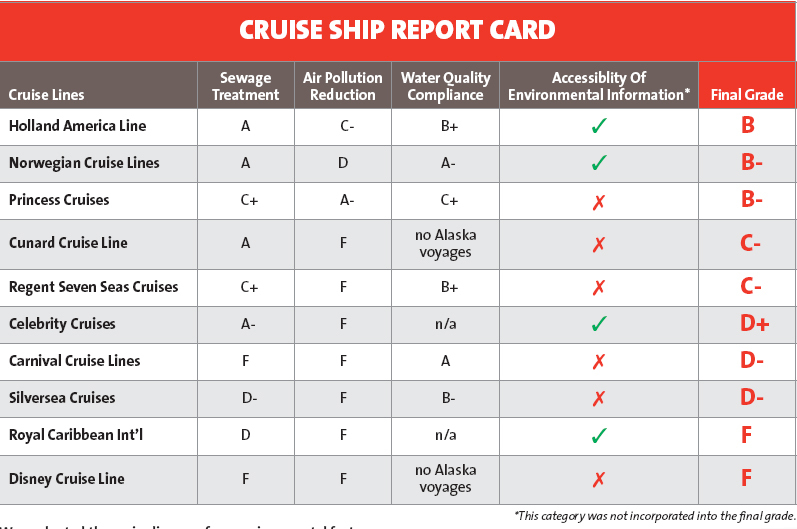 Friends of the Earth issued its first-ever Cruise Ship Environmental Report Card, an assessment of the environmental and human health footprint of cruise lines and ships operating in the United States. Millions of Americans take cruise vacations every year. Travelers may not realize that taking a cruise is more harmful to the environment and human health than many other forms of travel. Cruise ships carrying up to 7,000 passengers and crew are like floating cities that release substantial amounts of pollution into the air and water. Cruise ships have the potential to despoil the very areas they visit and passengers often ask whether there are any cruise lines or ships that are environmentally friendly. Friends of the Earth’s report card ranks 10 major lines—Carnival Cruise Lines, Celebrity Cruises, Cunard Cruise Line, Disney Cruise Line, Holland America Line, Norwegian Cruise Lines, Princess Cruises, Regent Seven Seas Cruises, Royal Caribbean Int’l, and Silversea Cruises—according to three environmental criteria: sewage treatment technology, air pollution reduction, and water quality compliance in Alaskan waters. Holland America, Norwegian and Princess come out on top, and Carnival, Royal Caribbean and Disney are rated the worst. An explanation of Friends of the Earth’s grading system, information about the environmental impact of individual cruise ships, and actions people can take to pressure cruise lines to clean up their act can be found at http://www.foe.org/cruisereportcard. A PDF of the report can be found at http://www.foe.org/sites/default/files/CruiseReportCard.pdf. When Cruise ships dock they should plug into the city’s electricity grid cutting their engines and their diesel air emissions. This will cut pollution. Are there strict international guidelines on polution of these “floating vllages” ? It’s nice to see that the major lines doin’ so well, but the Disney cruiseline should be punished in some way, so they will make improvement in this important issue. Wow, never would of guessed that Disney is such a huge polluter. This will raise some heads! I never thought that it is such a huge pollute, something should done about it. Travel agents should have to show you this sort of information for cruises, and also for normal holidays. I’m new to cruising and have had several fellow travel writers ask about the environmental impact of cruise ships on the ocean. Thank you for this informative post and the cruise ship report card. As others have said, Im suprised to see Disney doing so bad, and I agree this type of stuff should have to be displayed on all cruises and flights. I think people might think twice about certain holidays and cruises if they saw how much damage it does to the environment.